When my 2-year odyssey came to a close about 6 years ago, it did so gradually. I’d sold my house and placed my possessions in storage to travel the world, so there was no real “home” to return to. When I landed back in Portland, some of my closest friends took me in, letting me sleep in their guest room for 4 months while I biked to coffee shops all over town to write about my adventures. Riding and Writing were the two things that made my days feel complete. Something about each holds a key to my sanity, raising my spirits and opening my soul to the world. My tiny laptop had made the journey across the globe with me, tucked neatly in my pack, hammered on diligently in cafes and town squares from New Zealand to Peru. My bike had stayed behind, the last item placed into my storage unit before I pulled the roll-down door to the floor and snapped a padlock into place. Once back in Portland, I wasted little time reclaiming my riding companion and the red pannier bag my high school chemistry teacher and first riding partner had taken off her bike and hooked onto mine when I was still in high school and learning how to ride the steel frame beast she’d appropriated from a colleague so that she could teach me to ride in the mountains of Idaho. My Portland coffee shop writing sessions led me to a blogging competition in Vegas where I met someone who worked on films in L.A. “You should come work on this project I’ve got,” turned into, “see you next week,” and within a year I was living full-time in California with a carload of things from storage, largest among them my bike. There’s something about a reliable bicycle. It becomes an extension of you the way a good softball mitt does, expanding your physical ability and opening your imagination. L.A. isn’t the most bike-friendly place, though it’s making efforts, but having my bike nearby has always been a physical reminder that I’m self-sufficient. I could ride that bike across town if I needed something. I could probably ride it across the country if I needed to…couldn’t I? 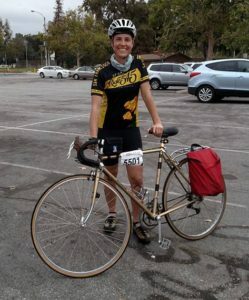 When I took a full-time job in L.A. it was for AIDS/LifeCycle, a cycling fundraiser for HIV/AIDS services, where thousands of people ride from San Francisco to Los Angeles, raising thousands of dollars each. I hung my bike on my office wall – a badge of honor for the time I spent in the saddle in Idaho and as a daily commuter in Portland. From time to time I’d pull her down and put her on a stationary trainer, or go on a training ride with the people preparing for the big Ride. But, being staff, I knew I wouldn’t be able to make the 545-mile journey on two wheels so long as I worked for the Ride. For most staffers, this is a regrettable sacrifice. Most have done the Ride at least once, and, having that life-altering experience, come to work for the event. For me, leading the L.A. staff, the fact that I’d never ridden the Ride was a dark secret. Something I didn’t talk about unless I had to. So for four event seasons, I drove from SF to LA, tending to the logistics and experience of 3,000 people who were proving to themselves the true extent of their self-sufficiency. The bike on my wall served as a shield, allowing staff and participants to believe that I was one of them. During the 4 years of my career at AIDS/LifeCycle, I was responsible for raising more than $25 million. But during that time, I never rode a mile of the Ride, and I raised very little money directly. Most people come to fundraising jobs having been participants in events; having raised the money and ridden the miles. Not me. But about 6 months ago, I got a promotion. One that kept me involved with the Ride, while pulling me out of the day-to-day operations of the event. It wasn’t long before “maybe I can ride now…” crept into my head. As I said, L.A. isn’t a place I feel super-comfortable hopping on a bike to go to the store, or even to work, just a few miles away. But I’m a pro at riding on a stationary trainer in front of the TV, and AIDS/LifeCycle has a fantastic training program – one that teaches you how to clip in and out of pedals, one that teaches you what to eat, and how to shift, and what it’s like to ride in a large group on the Pacific Coast Highway. For many people – especially those who weren’t picked first in gym class and who weren’t starters on the football team – the Ride provides an incredible sense of empowerment. It provides a place to fit in and explore physical limits for the first time. For others, it provides great lessons in humility as chains break or weather turns. As I contemplated doing the Ride, I wondered what it would be like for me, someone who knows the event without ever having done it, to ride the miles and raise the money. So, when I signed up for the 2017 AIDS/LifeCycle event, it was with more trepidation that I’d expected. What if I can’t get in shape in time? What if I don’t raise the money? What if I’m actually a really terrible cyclist and everyone sees? A new bike? I’d considered it before. My 1975 Motobecane is older than I am, but I’ve been riding it for over 20 years now. We know each other. I spent the first few training rides of the season talking with people about bikes, trying other bikes, and thinking about how much lighter and easier it would be to ride up a hill on a carbon frame bike with more gears. And then I got sad. There’s a point on the Ride, halfway between SF and LA, where people climb on a rock, hold their bikes over their heads, and take a picture to celebrate how far they’ve come. When I think about raising a bike over my head, it’s not a slick, light, carbon frame bike. It’s my 1975 steel frame. It’s the bike that’s been with me all along the way; the one that reminds me where I’ve been and how far I’ve come. Much like my friends…who will need to donate generously if I’m ever going to raise that $20K.